I have a RPI3 and I just bought an Afterglow PS3/PC wireless controller with USB dongle. I plugged in the dongle and when i press the connect button on the controller it just continues to flash without connecting. I tried the controller on a PC and it connects fine. I checked the compatibility list and it says this controller should work. I tried all the options in recalbox.conf for the ps3 controllers with no change. This controller does not use Bluetooth. Ok so when I plug the dongle into the PC there is a red led on it that comes on, but it doesnt come on when in the raspberry pi. I even plugged it straight into a charger block to see and the light came on and the controller kind of half connected, which is more than it ever did with the pi. I tried a few different charger blocks and cords in case it wasnt getting enough power. Is there a way the power to USB can be turned on and off internally? I know that the issue is with the software, not the hardware. 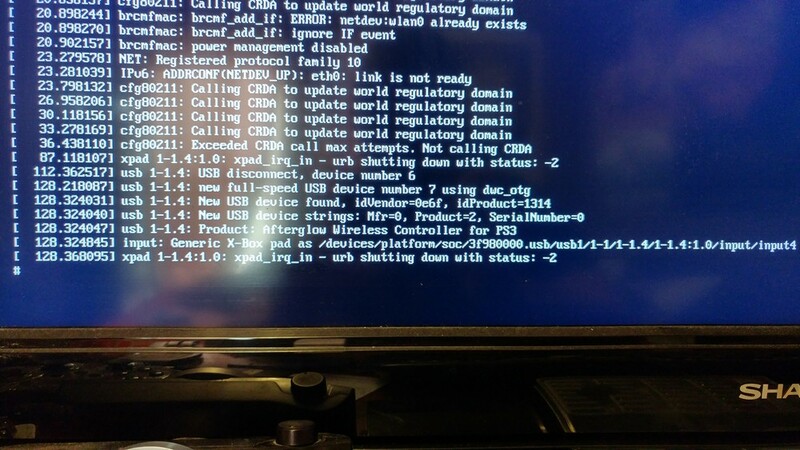 I took a spare sd card and flashed a different OS to it, and when I booted the Pi it synced with the controller no problem. Does anyone have any suggestions? I tried every possible combination in the recalbox.conf turning on and off the ps3 or xbox controller options but no change. I'll attach a pic of what I get with dmesg from the root prompt. Sorry I'm not sure how to get a screenshot from it. is there an update available or is that something the devs have to release? Just a follow up: the new version 4.1 seems to support the controller. Thanks! Did you mean 4.0.1? I just got the same controller, and am having the same problem. I'm updated to the most recent version of RecalBox - I believe it's 4.0.2, but I still cannot connect the controller. It connects to my computer no problems.